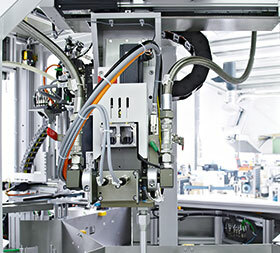 For more than 25 years, Scheugenpflug AG, based in Neustadt, Germany, has created machines and production lines for dispensing and metering equipment used in the automotive industry. High-end-automation – with PC-based control and CNC technology from Beckhoff – enables finely-tuned processes and production results with high repeat accuracy. TwinCAT CNC software ensures high-precision motion control in the dispensing system. Böhm describes the benefits of this CNC solution, which is seamlessly integrated into standard PC-based control technology: “In addition to system continuity, the PC-based CNC offers further advantages. On the one hand, it is very fast and efficient. On the other hand, we ­benefit immensely from the openness and flexibility of the CNC for functional extensions, which helps us achieve optimum application-specific functionality. Further benefits offered by TwinCAT include the powerful high-level interface (HLI) between the CNC kernel and the PLC, as well as the customisable parameter interface. The CNC parameter sets can be generated directly from the PLC project, enabling quick and flexible response to different requirements. In this way, the functionalities commonly requested by customers can simply be mapped as software modules, facilitating a high degree of parametrisation and more efficient software development. The Beckhoff C6920 Industrial PC forms the core of the control system. Together with five two-channel Aservo drives and two single-channel Aunits – each equipped with a TwinSAFE card – it provides 12 dynamic and precisely-positioned servo axes via the servomotors. A total of 21 EtherCAT Terminals, 15 TwinSAFE Terminals, 21 EtherCAT Box modules and a TwinSAFE-EtherCAT Box provide comprehensive data acquisition and safety functionality. In addition, the dispensing system offers a high degree of ergonomics for machine operators. Three CP3915 multi-touch control panels ensure that machine operators have access to all required information at any time from any angle. A 3-D visualisation of the dispensing contour can be used to check the results of the G-code programming before starting the actual dispensing process.